Póg has just launched a sister restaurant on Tara Street and it’s a must hit up spot in the city centre for that Instagram worthy brunch. The café culture is stronger than ever before in Dublin so they have been booming since the store opened but even more so in the last two years. It is just another restaurant that has been added to the list of millennial brunch spots springing up around the city. They have added a second shop to their small branch with their original restaurant being on Bachelors Walk just off O’Connell bridge. The original Póg restaurant started trading back in February 2014 and has been so successful with creating the perfect breakfast and brunch menu that people just keep coming back for more. Rachel Keane the Póg owner created the restaurant branches to offer “healthy and low-calorie options” according to their website. Póg is renowned for their protein pancakes which are a customer favourite in both restaurants menus. The new Tara Street store is only a six-minute walk from the original Bachelor’s walk store, however has something totally different to offer. Firstly to note, immediately when you walk in it’s a totally different feeling to the original store. The marble table tops and the neon pink light saying “find what you love.. and do it” is very trendy and immediately gives that urban vibe. It was an incredibly smart marketing ploy to have people who go the café want to tag and location drop the store. The Póg brand has always been very successful with their online marketing mainly through Instagram and has a very steady following. Currently, they have 27.4k followers on Instagram which helped launch their new store which has been packed out since day one. They display their specials from Tara Street everyday on their Instagram stories. They are responsibly priced and always different which urges customers to check it out. The new restaurant is an open plan space where you can see the chefs cooking the food in front of your eyes which emphasises the message of fresh food to the customers and gives a real buzz around the place. On arrival, you are immediately greeted by a waitress who brings you to a table. The restaurant floor isn’t a big space but it has bar seats where you could do some laptop work while having a coffee. It also has a large bench table which you are able to book for a big group by emailing the store. The rest are all two or three seater tables which are marble topped, which looks very classy and provides the perfect backdrop to take a picture of your food. The menu for this store is fairly priced considering the quality of the food. The quality is incredible at that price point and the presentation of the food is amazing. It looks good but also tastes amazing. The most expensive thing on the menu is €14 which makes it affordable for students but also an ideal hang out for a party or if you just want to go for brunch with some of your friends without breaking the bank. Póg has curated the menu perfectly to suit everyone. They offer vegan and vegetarian dishes and guarantee everything is made with your health in mind. They don’t use any refined carbohydrates or sugar but focus on good fats and protein. They offer their famous protein pancakes but let you choose whichever toppings you wish, which is a major selling point. 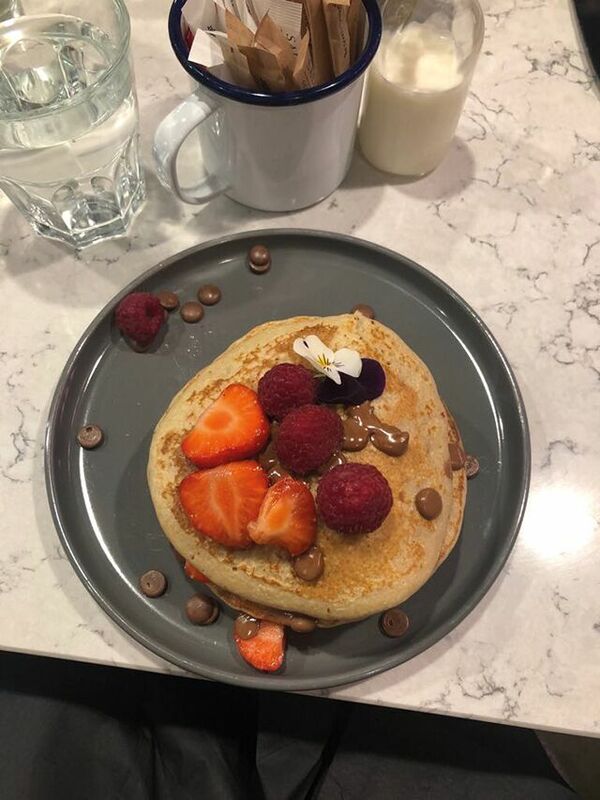 According to their website, the protein pancakes are only 257 calories per portion and contain 27 grams of protein(before toppings) which means if you have a sweet tooth Póg are providing a healthier brunch alternative for you. The menu in this store gives a massive amount of variation with acai bowls, toasties, avocado toast and large array of salads to choose from. They also offer something they call the hot pot which is different every single day. It’s a dinner meal which can include anything but usually is some sort of stew, perfect to warm up on a cold wet day. They usually have a daily pancake special and if you keep an eye out on their Instagram sometimes offer a 2 for 1 pancake special. The general vibe in the restaurant is great, the place is buzzing with people constantly moving and it feels very fast paced with the kitchen right in front of your eyes. The staff are great, especially the waitresses who are very friendly and explained all the specials as soon as we sat down. The layout is ideal, meaning the tables are close enough together to feel cosy but not too close that you can hear other tables conversations. Everything is about the food and presentation is quality. However, there is one downfall, some of the beverages are very highly priced. A mocha costing €3.80 and €4 for a Nutella hot chocolate is a big ask for anyone. All the lemonades, sodas and ice teas are €4 and above and are quite small glasses. So this is something Póg definitely need to consider tweaking. The beverages are quite good to taste but it is just a lot of money for a hot drink considering the reasonably priced food menu. Overall Póg Tara Street is a must visit restaurant for brunch in the city centre. Located just off Pearse Street and beside the Trinity Luas stop it’s easy to get to and from. Its prices are competitive for the amazing quality food you get and the restaurant’s menu caters for everyone. It’s a great spot with a great buzz and a lovely place to meet with friends.